Rachael Dichter (Performer) is a Berlin+San Francisco based dancer, performer, choreographer and curator. She studied dance and art history at Mills College and was a 2015 Danceweb Scholar. Her work has shown at Dock 11 Berlin, Ponderosa Tanzland Berlin, Paf St Erme, Joe Goode Annex San Francisco, On the Boards Seattle, Northwest New Works Portland, and she has been lucky to collaborate with a number of fierce and talented folks including Laura Arrington, Mica Sigourney, Ruairi Donovan, Allie Hankins, Sara Kraft, Abby Crain, Jesse Hewit, Marten Spangberg, Keith Hennessy and Jess Curtis, and for four years she co-curated the San Francisco based live arts festival THIS IS WHAT I WANT. Matthias Herrmann (Composer) studied cello with Rudolf Mandalka at the Robert Schumann Hochschule, Düsseldorf, and is a graduate sound engineer. He has created numerous scores for the productions of international dance theater companies including Do Theater (St. Petersburg), Fabrik Company (Potsdam), Howard Katz (Berlin/New York), Claire Cunningham (Glasgow), Jess Curtis/Gravity (San Francisco/Berlin). He also created soundscapes for video-installations, music for short film and documentaries. He was working as a composer and musical director for Staatsschauspiel Dresden, Schauspielhaus Bochum, Deutsches Theater Berlin, National Theatre of Scotland and others. In 2008 he was prized with the Isadora Duncan Award for the best soundtrack for 'Under the Radar' for Jess Curtis/Gravity. In June 2014 his opera 'Didi und Stulle' premiered at Neukoellner Oper Berlin. Céline Alywn Parker (Performer) A native of San Francisco, Céline Alwyn-Parker has been performing, teaching, and creating professionally both nationally and internationally for 10+ years. She has performed and toured with Cirque du Soleil’s Dralion and on Broadway in the musical Bombay Dreams and worked with several local and international contemporary choreographers including Kimi Okada, Jo Kreiter, Christy Funsch, Katie Faulkner, Amelia Rudolph, Rachael Lincoln, Garry Stewart, Rui Horta, & Ben Duke. In 2008, she completed with distinction a Master of Arts in Dance from the London Contemporary Dance School and in 2011, received an Isadora Duncan Award for her role as a dancer in Terra Incognita: Revisited. Sherwood Chen (Performer) As a performer, Sherwood Chen has worked with artists including Anna Halprin, Xavier Le Roy, Amara Tabor-Smith, Min Tanaka, Dohee Lee, l’agence touriste, Marina Abramovic, Sara Shelton Mann, inkBoat and Grisha Coleman. 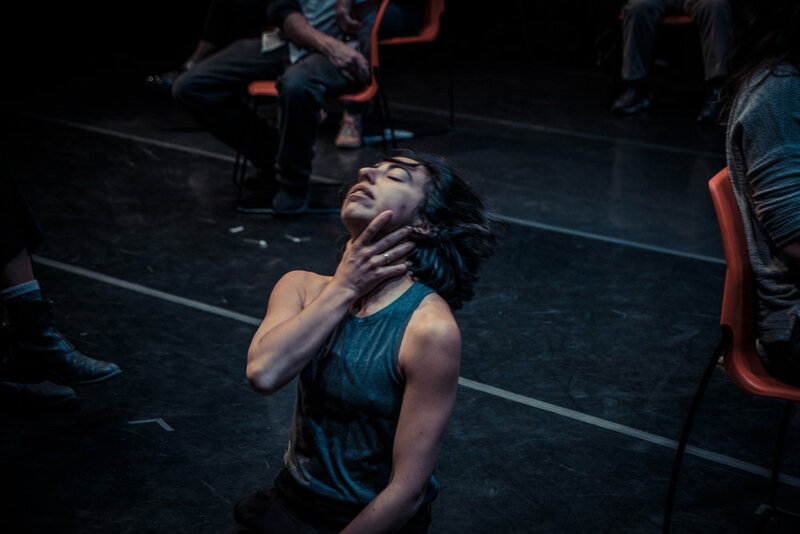 He leads workshops for dancers and performers internationally, and for over twenty years has contributed to Body Weather movement research initiated by Tanaka and his contemporaries. Tiffany Taylor (Performer) is a queer and self-identified disabled performance artist working to bring greater accessibility to the performing arts and challenging society’s perceptions of those with disabilities. She has worked with numerous disability awareness groups and She advises on the creation and implementation of audio description, touch tours, captions, sign language interpretation, wheelchair access and attention to a wide range of access considerations, which is not only necessary to make performance accessible to people with disabilities, but also beneficial for everyone involved. As a blind performer, she hopes to challenge questions of perception, identity, possibility and the creative process. She holds a BA in Theatre from Adrian College-Adrian Michigan and has studied Shakespeare at the University of Oxford. She has performed at Carnegie Hall as a member of the Adrian College Choir and has competed as a National Association of Teachers of Singing vocalist as well as an actor as an Irene Ryan Scholarship nominee at the Kennedy Center American College Theatre Festival. Her passions are performance and disability and the intersections of these worlds. She has experience in acting, musical theatre vocal performance and contact improvisation dance.